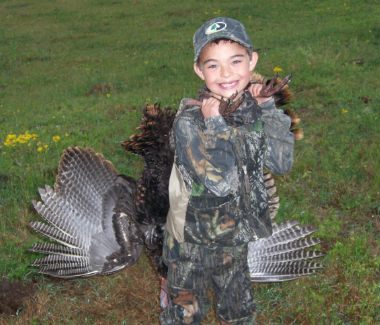 I never imagined I’d say those words to my son on his very first turkey hunt. Being still and quiet doesn’t come naturally for a seven-year-old. I wasn't real confident that we would even get a bird in gun range that day. I definitely didn't think that three of them would be staring a hole through us from just a few steps away. It was opening morning of the spring turkey season in Texas. There was no place in the world we would rather be than in the turkey woods, together. In the past, Hudson had accompanied me on several hunts as my sidekick. On this warm April morning, however, I was the sidekick and he was the hunter. The night before, we went through a ritual that is familiar to most avid turkey hunters: we made a list of things to bring, packed our bags, checked the weather forecast one more time, and then stayed up way too late for guys needing to get up just a few hours after midnight. But, we’re turkey hunters after all. That’s what we do. Three-thirty in the morning comes early, but that day, it couldn’t come soon enough. We met up with six of my buddies and began the two-hour trip west, to some private land that reportedly had “a ton of turkeys” on it. The property offered a beautiful river bordered by tall trees with plenty of roomy, horizontal roosting branches. As if that wasn't enough, a plush green grass field met the edges of the river and had “please land in me after you fly off the roost” written all over it. On the ride there, we passed the time by developing a strategic plan of attack that would make an Army General proud. The plan was to divide and conquer! And that’s exactly what we did. We divided into four groups of two in hopes of conquering those Rio Grande long-beards. Under the cover of darkness, groups set up about 250 yards apart, 150 yards from the river. Hudson and I, however, decided to set up on a 10-acre field up the hill, behind the rest of the crew. We picked our spot because the property owner said that birds often move through that field in the mornings. I also wanted to put some distance between my rookie turkey hunter and the seasoned vets below us. We set out a jake decoy and two hens, and then nestled up against a tree in the wood line. Feast or famine, we were set. No more waiting. The hunt had begun! In the calm of the morning, it seemed like you could hear everything for miles. Before the first ray of light broke over this turkey hunting paradise, a vocal gobbler responded to the “who-cooks-for-you” calls of a barred owl. Hudson and I looked at each other with excitement. The first gobble is always the most exciting. As the sun crept above the horizon, the musical recital began. The sound of almost-continuous gobbles echoed down the river and up the field where we sat. I knew my buddies were right on top of them, and I figured it would only be a matter of time before we heard the roar of a 12-gauge, putting a smile on someone’s face. Fifteen minutes later, it happened. The yelp from my Woodhaven Cherry Classic Crystal slate call was answered by a trio of gobblers about 200 yards away. We couldn’t see them yet, but we knew they were there. And we were ready! Another ten, long minutes passed with no sightings of red heads. I decided to give them a few soft yelps to see where they were, and to remind them that we were still there. My calling was cut off by three simultaneous gobbles. They were close and coming closer. That would be my last call of the morning. A few minutes later, we finally saw them. They were 75 yards away and headed straight to our decoys. After a quick scan I realized they were all jakes. For Hudson’s first turkey, however, a big jake was just as appealing as a three-year-old, big-spurred tom. They closed the remaining distance quickly. Unfortunately, the fast pace of the jakes didn’t offer Hudson a good shot opportunity once they reached the decoys. After a few quick circles around our decoy setup, they did something totally unexpected. They headed straight for us! It amazes me how a turkey can pinpoint the exact location of a call. Even though I hadn’t called since they were 100 yards away, they knew exactly where my call had come from. “Don’t move a muscle,” I told Hudson. The jakes were 15 yards away and still coming toward us. At five steps, I whispered, “Wait, don’t shoot yet, they’re too close!” They were too close for us to make any adjustments, and too close for me to talk him through the final steps of squeezing the trigger. It seemed like it took an eternity, but the birds finally turned around and headed back into the field. Quietly, I told Hudson to “pick one out and take the shot when you’re ready.” As if he had been doing it for years, he lined up his sights on the biggest one and squeezed off the trigger. The big jake began that familiar turkey flop that we all love to see. Hudson’s first turkey was on the ground! After a few quick smiles, hugs, and high-fives we both ran out to see his prize. Compared to Hudson, the bird was huge. He could barely pick it up. I proudly watched as he put his first turkey tag on the jake's leg and then posed for pictures. Hudson will never forget the day he shot his first turkey...and neither will I.